The title of this post probably has many of you intrigued. Over the last two years or so, I’ve written on some rather serious issues: doctrine of perseverance, inclusivism and theology of religions, Calvinism, Arminianism, Molinism, Open Theism (these four soteriological systems), etc. I’ve written on many books that really didn’t fit with the sections I’ve created at the blog. Today, however, I am paying a return visit to the “Faith and Film” section created here at the Center for Theological Studies. I love the study of faith and film with all my heart, and I don’t get to study it enough. Now that I’ve graduated, I can finally sit back and pursue some things that I think are just as enjoyable as my academic research, but are “academic” in perhaps a different way and still pursue the glory of God. First off, before I get into an analysis of the Teenage Mutant Ninja Turtles story (which, from the videos, is a rather long one), let me just encourage those of you who have children to watch the cartoon episodes with your children. I loved TMNT as a child, and I imagine they will too. There are more such cartoons on Youtube, and they will certainly enjoy many of the other episodes of TMNT available on Youtube. Thank God for those who placed these online! This blog post was created in my mind during the cartoon watch itself. 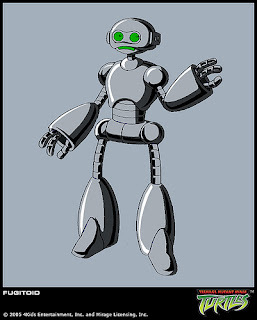 Professor Honeycutt is a robot who created the teleportal, a device that both the Triceraton (the space creatures) and the earth inhabitants (called “The Federation”) desire to possess to use against one another: the Triceraton desire to make themselves undetectable and destroy the Federation, while the Federation desires to destroy the Triceraton for good. The only one who has the knowledge of the teleportal device (its makeup and building plans) is Professor Honeycutt. This explains why both sides (Triceraton and Federation) desire to capture the Professor. Professor Honeycutt’s last statement should ring a bell. Honeycutt’s last words on this video are a spin-off of Jesus’ words from John 15:13--- “Greater love has no one than this, than to lay down one’s life for his friends” (Jn. 15:13, NKJV). With these words, the cartoon producers want Christians to get the hint that Prof. Honeycutt is a “Christ figure” in this cartoon. I don’t think the hint could be more direct. As the cartoon progresses, though, we find that there are other characters surrounding Honeycutt who play a role in the action (in the same way that other persons surrounding Jesus play a role in the events leading to Jesus’ Crucifixion). After Prof. Honeycutt sends the video to the Utrom High Council (knowing that the Triceratons will come get him), he waits with the Ninja Turtles for the Triceraton arrival on earth. 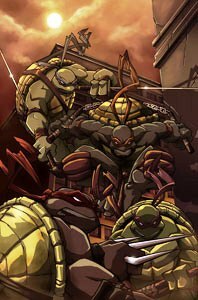 Once they get here, the Ninja Turtles surround Prof. Honeycutt and pull out their weapons: Leonardo pulls out his two swords, Michaelangelo his nunchunks, Raphael his daggers, Donatello his staff, all to defend the Professor from being captured. The scene here reminds us of the Garden of Gethsemane, where Jesus, after praying, is surrounded by His disciples as the Roman guards come to arrest him. The disciples, like Professor Honeycutt’s supporters (the Ninja Turtles), pull out weapons to defend Him. In the case of Jesus, Peter [like Leonardo] is the disciple who pulls out his sword and (according to a Gospel account) cuts off Malchus’s ear (Malchus being one of the Roman soldiers in charge of arresting Jesus) [see John 18:1-11; Luke 22:47-50]. In some sense, the “Utrom High Council” refers to a power above Prof. Honeycutt. Here, it could be said that the Utrom High Council represents divinity, deity, Godhood, God Himself, since the High Council is outside of earth and lives above the Galaxy itself. The High Council, at any rate, seems to be the “superior” to which Prof. Honeycutt informs that he will “surrender himself to the enemy.” Jesus surrenders Himself to the enemy, turns Himself over to the Sanhedrin to be tried for the false charge of treason. But there is also an opposing power to the Triceratons, a power simply known as “The Federation.” The Federation is really another code word for “US Government,” and the Federation wants Prof. Honeycutt’s plans for building the teleportal as well. The Federation is represented by General Blank. The Federation here represents the Pharisees of the Gospels, who simply wanted Prof. Honeycutt (the Jesus character) for their own selfish purposes. Last but not least, what about Prof. Honeycutt? He serves as the Christ figure by performing the ultimate act: giving his life, infecting the Federation system with a virus after being connected to the system itself. The system is closed down to prevent the virus from uploading (by the Federation), but Donatello has to cut the system on in order to allow Prof. Honeycutt to finish uploading the virus. This scene is similar to Simon of Cyrene helping Jesus carry His cross up to Golgatha, the place of the skull [Matthew 27:32]. In the same way that Simon “assisted” Jesus in performing the ultimate sacrifice, Donatello does the same thing for Prof. Honeycutt. My final thoughts: I think every parent should watch this cartoon with their children. Even if one is an adult without children, he or she should still watch these few episodes to see tenets of the Gospel displayed in cartoon fashion. I enjoyed watching the episodes; but the fact that they serve as a great springboard for child (and adult) evangelism excited me even more. I hope you find them to do the same.